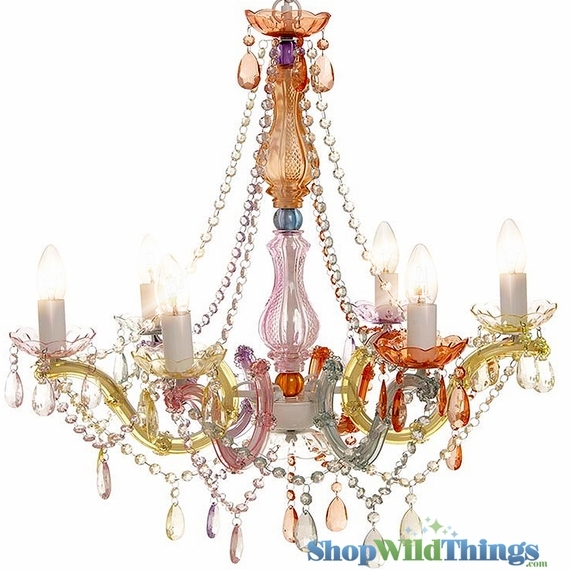 Our Large Gypsy Pastels Chandeliers collapse for easy storage and transport, making them a favorite for event decorators.The ShopWildThings Gypsy Pastels chandelier will add class and intrigue to your home, event, or retail environment. 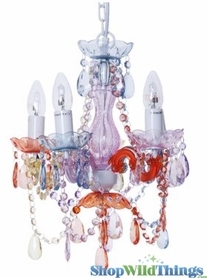 Dripping with beads, this 6 arm chandelier is constructed beautifully using acrylic, glass, and resin. The colors in this chandelier make it possible to build an entire room around the lamp. The chandelier body is 22" in diameter and 26" tall. The hanging chain is 8.5' long and the cord is 12.5' long and comes with an on/off toggle switch. This long cord length allows you to swag the chain across the ceiling and plug in to a wall outlet. A mounting bracket with hook is also included. Use six E14 bulbs, max 25 watts each (bulbs not included). These lamps are plug-in style but can be converted to hard-wire by an electrician or other qualified individual. This chandelier weighs 7.5 lbs. Packaging great. Arrived promptly, easy to put together and install. the effect is breathtaking. Really. 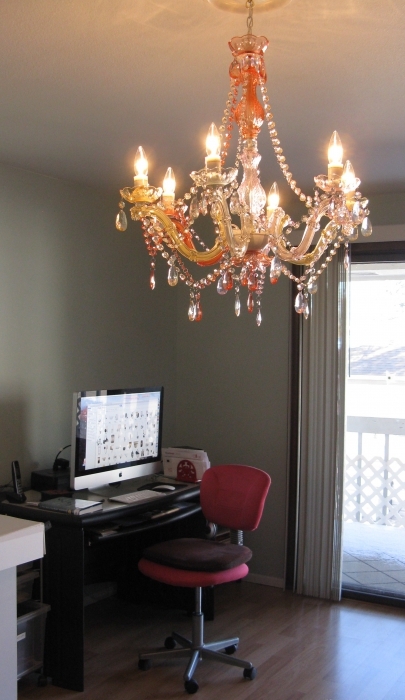 ConsI keep seeing places to install a fourth or fifth chandelier. 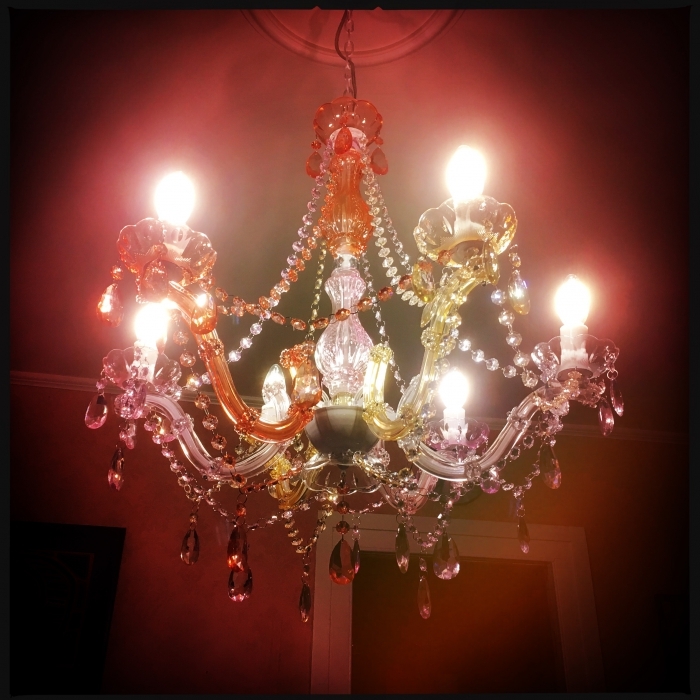 This chandelier looks beautiful and adds a touch of whimsy to our 150 year old home. We love it! Merchant Response:Wow! Beautiful photo, thank you so much for sharing! Great candelier for any part of the house that you want to be funky with! Great Product! Wonderful colors and good price! I love this chandelier, it's so funky chic! It is plastic but hello, it's rainbow colored! It was easy to put together, perfect for a boutique, I am very pleased!